It’s Day 9 of 12 Days of Christmas Cocktails! 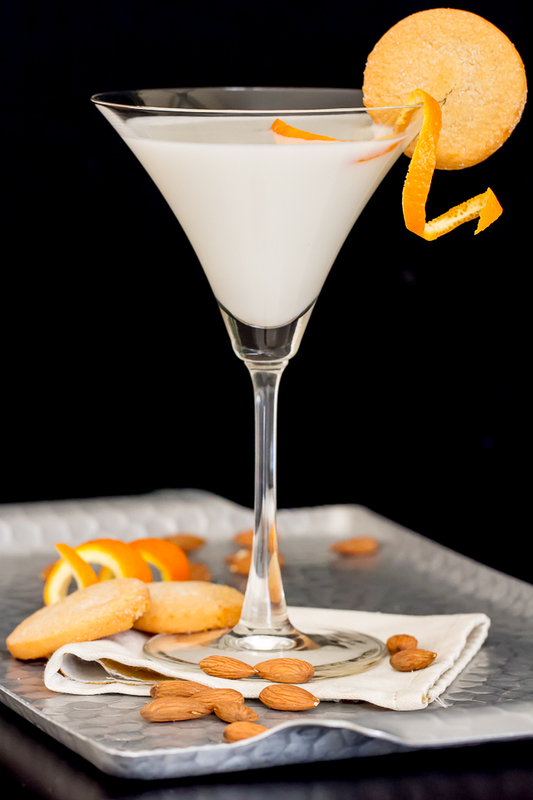 Today I have a almond/orange flavored Christmas Cookie Martini to share. Originally I planned to make a sugar cookie martini. 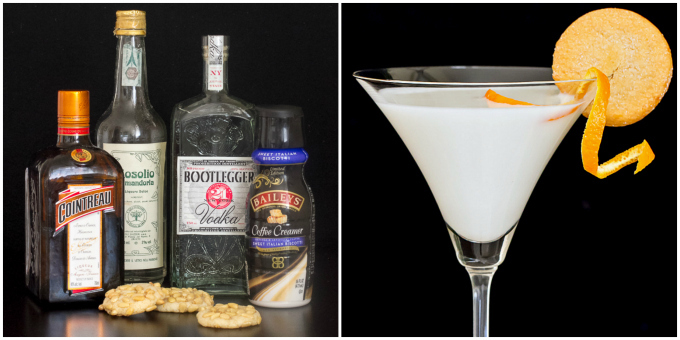 Instead, I came up with this martini, inspired by a cookie I made recently for a cookie roundup with The Bitten Word (check out their site…tons of holiday cookie recipes). My assigned cookie was a Pignoli Cookie and I loved the almond/orange flavor of the cookie, just wasn’t that thrilled with the outcome of the cookie itself. So I thought, why not turn that wonderful flavor profile into a martini! Here’s the cookies… pretty though, aren’t they? On a side note, I have a confession to make. I seem to be having a lot of “senior moments” lately. Take this drink picture for example. You may wonder why, if this martini is inspired by a Pignoli cookie, that I have it garnished with a sugar cookie???? Well, simply because I completely forgot I had the Pignoli cookies in the freezer and had sugar cookie martini on the brain when I went to shoot the photos! I wish I planned better when it comes to taking photos. Or be a master of photoshop. Sadly, I’m neither. Let’s just pretend the sugar cookies are almond/orange flavored cookies. Yeah, that works for me. 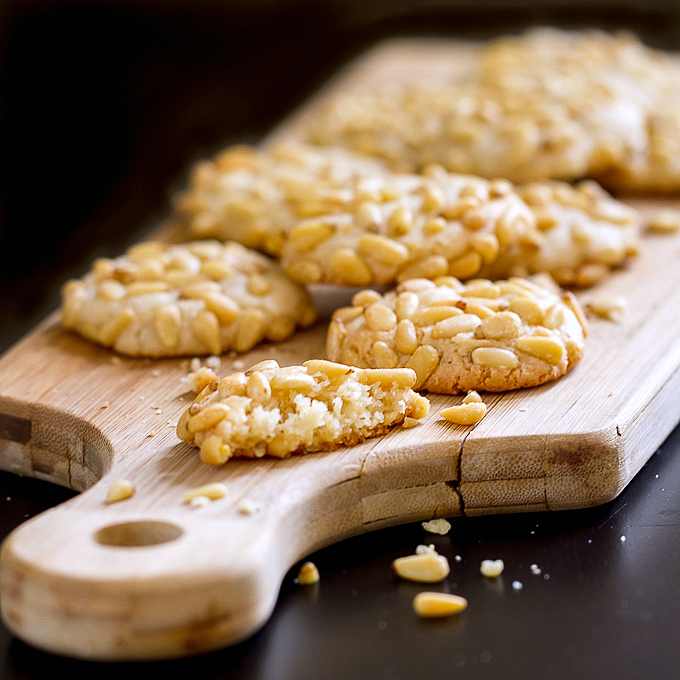 Besides, I really didn’t even taste the pine nuts much in the Pignoli cookie anyways. Okay back to this drink. I bought a container of Baileys Sweet Italian Biscotti coffee creamer last week thinking I might be able to use it in a martini (oh crap! Maybe I should have a biscotti in the picture too?). I know it may sound weird, but flavored coffee creamers work well in martinis. I used one last year in a Peppermint Mocha-tini that my girlfriends and I loved. For this Christmas Cookie Martini I started with vodka, then added a bit of the creamer, some almond liqueur and orange liqueur. To lighten the drink a bit I added a shot of club soda. I’ve been doing that lately with these sweet, creamy drinks and like the result. Maybe I should have called this a White Christmas Cookie Martini since it’s a white drink? Doesn’t matter what it’s called, it will remind you of a delicious Christmas cookie! And since I’m not baking any more cookies this year, I’ll drink this instead! Combine ingredients in cocktail shaker filled with ice. Shake well and strain into chilled martini glass. Garnish with a cookie and orange peel, if desired. Loving this series, Judy! Such a brilliant idea. These recipes look amazing and so unique from each other. Thanks Sarah…it’s been fun trying to think up different cocktails, but I’m about ready to do real food again! Happy Holidays! Haha! I feel ya’ Judy. I posted a pecan and Portobello pasta dish a few months ago, but, I named it “walnut and Portobello.” One of my readers politely pointed out that the nuts in the photo were pecans, not walnuts. Talk about a senior moment!!! Your gorgeous photo more than makes up for the sugar cookie goof. Truthfully, I wouldn’t have noticed. 🙂 I think you could have called this martini cookies and milk. I’m sure Santa would appreciate this!